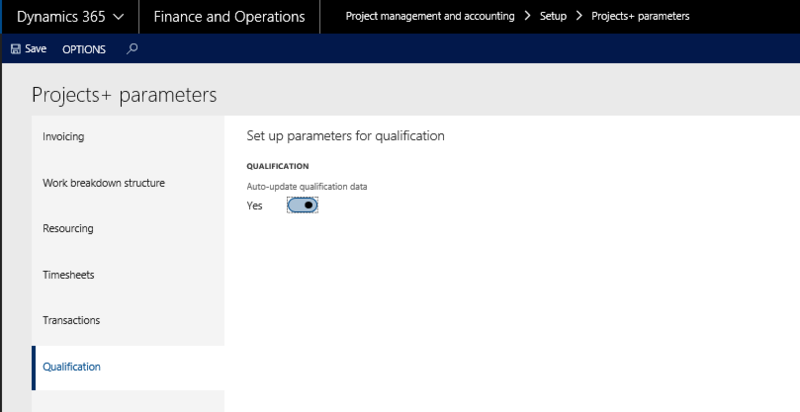 *This section details how the employee and time details are added to the the project qualification data form. In the project Projects+ parameters, a new parameter for Auto updating qualification data has been brought in. The functionality of this feature is to automatically add the employee details and the time details after the timesheets are posted for the employee, into the project qualification data form. This parameter is available in Project Management and accounting module. Go to Project management and accounting > Setup > Projects+ parameters > Qualification tab. The following details of the employee is updated automatically when the above parameter is marked.